Time is monochrome on the UR-202 White Shark, with its case, dial and hour satellites all in an original shimmering silver/white hue emitted by titanium, steel, and ARCAP. The White Shark is a timepiece unadorned with no makeup, its only ornament is its technicality. The White Shark eschews colourful display to concentrate focus on l’art mécanique. The black numbers of the hours on the satellites stand out clearly against the light background; however one number of the 12-hour digits is the bright red exception to the rule that identifies the individual piece number in this limited edition of 12. 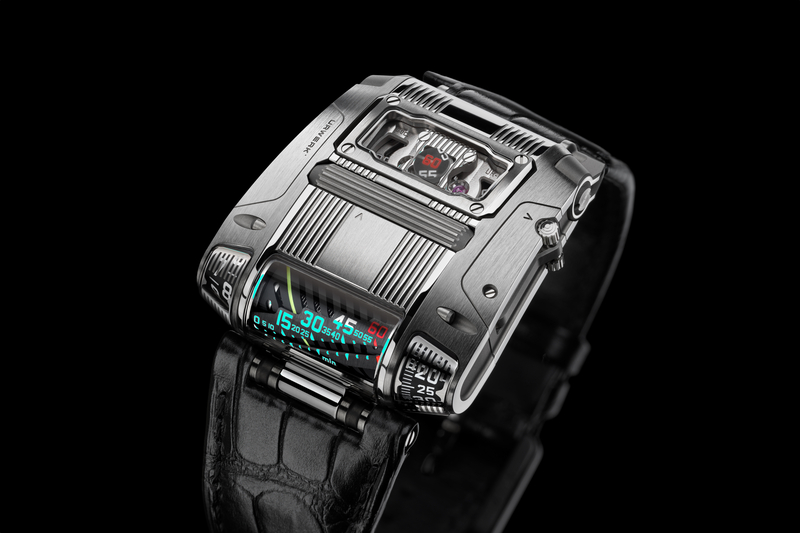 The White Shark, a limited edition of 12 pieces, is available exclusively from Chronopassion (Paris), The Hour Glass (Singapore) and URWERK. Time on the UR-202 is displayed using telescopic minute hands operating through the middle of three orbiting and revolving hour satellites. These hands precisely adjust their length to follow the three vectors marking the minutes: 0 -14, 15 – 44, 45 – 60. 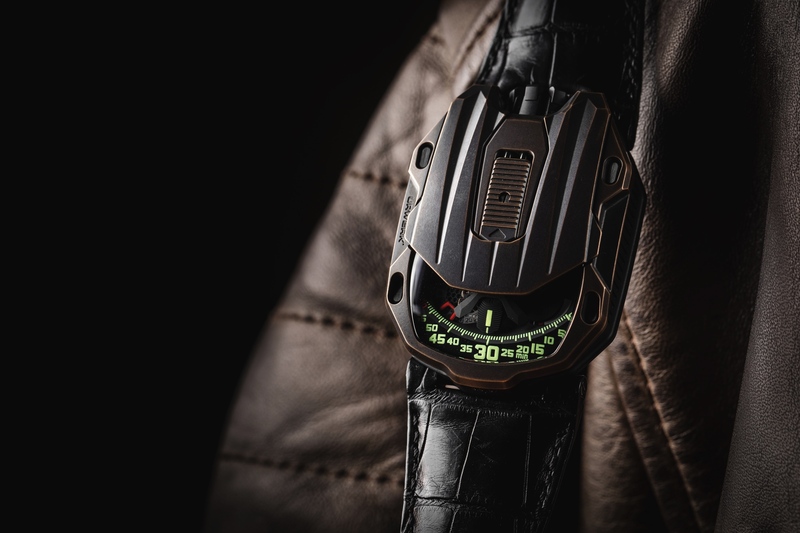 Extended, they enable the UR-202 to display the time across a large easy-to-read, dial. Retracted, they allow for a very wearable and a comfortable sized case. A moonphase and day/night indicator complete the dial. The patented central carousel is the nerve center of the satellite complication. It not only enables the rotating hour satellites, but also the high-precision maneuvers performed by the three telescopic minute hands. The carousel is a technical tour-de-force requiring fabrication tolerances down to three microns. Two turbines are visible on the back of the UR-202 “White Shark” and these are coupled to the rotor to regulate the winding system of the watch. The turbines are controlled by a three position selector lever. 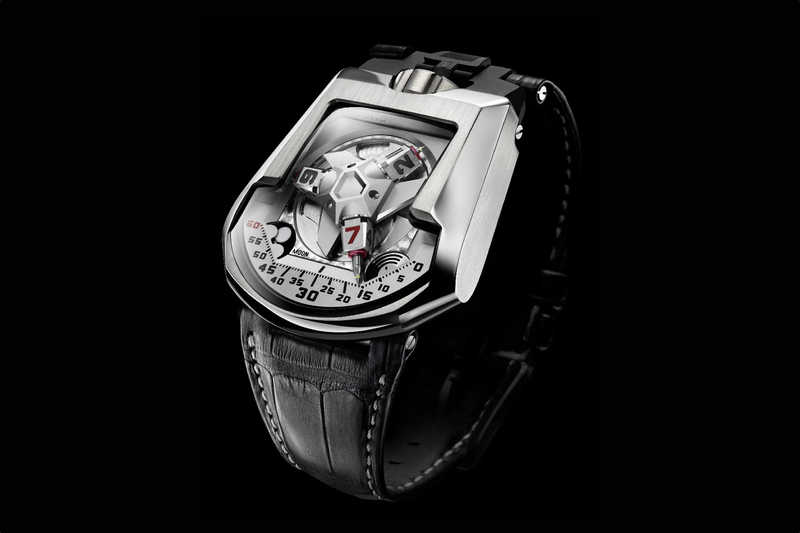 In mode “FREE”, the two turbines spin freely enabling maximum winding of the mainspring. In mode “Sport”, the two turbines spin with resistance, acting like pneumatic brakes that reduce the winding efficacy wound by 1/3rd. 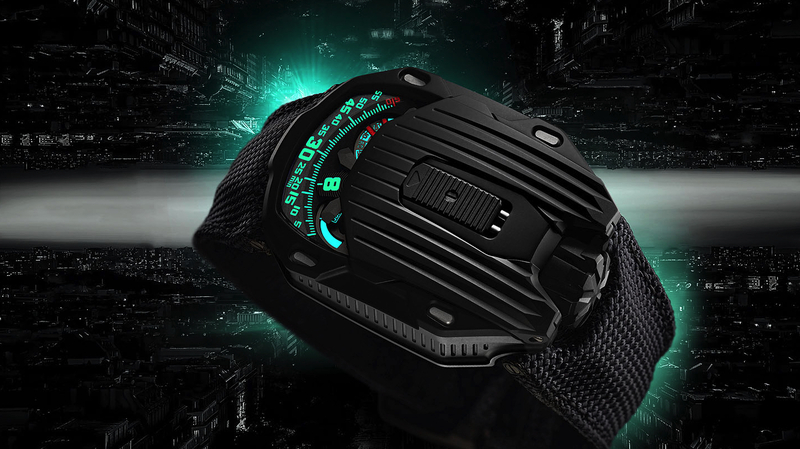 In mode “STOP”, the turbines are locked and block the rotor from winding at all, although the watch can still be manually wound if necessary.